This 40-foot Louisville extension ladder has a load capacity of 250 pounds. It is great for working on light construction and residential Jobs. It features D shaped rungs that are fully serrated for a slip resistant surface. It has mar-resistant rail end caps to protect landing surfaces and provide longer life. 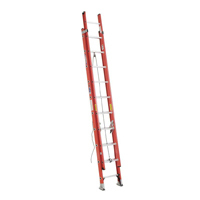 The heavy duty plated steel shoe with thick rubber treads makes this ladder safe and easy to use. It is one of many aluminum extension ladders in the Louisville line up. Cubes ft: 15.8 Max ext.